“Véronique” refers to dishes that are garnished with white grapes—Sole Véronique is a classic example. This update on Véronique uses red grapes, honey, and something I rarely saw in the modest, everyday France I frequent until recently: balsamic vinegar. In recent years, however, the prized Italian condiment has been popping up even on more humble tables, adding its hallmark depth and bittersweet touch to modern French home cooking. (The French term for bittersweet is, by the way douce-amère—sweet/bitter. That the French privilege the word “sweet” over “bitter” says a lot about their approach to life, n’est-ce pas?). P.S. : You know how well grapes and blue cheese go together? Serve this with a lightly dressed green salad topped with a bit of blue cheeses, as pictured above. C’est super! 1. Place chicken breasts, one at a time, between two sheets of plastic wrap and pound until 1/4 inch thick. (Or butterfly, or slice in half horizontally to make two thin scallops of each breast–click here to find out how.) Season both sides with salt and pepper; dredge in the flour and shake off excess. 2. In a large skillet, melt 1 tablespoon of the butter and heat the olive oil over medium-high heat. Add chicken and cook for 6 to 8 minutes, or until no longer pink inside, turning once (reduce heat to medium if chicken browns too quickly). Transfer chicken to a platter; cover with foil and keep warm. 3. Add garlic to skillet; sauté briefly. Carefully add chicken broth, white wine, and balsamic vinegar. Let boil until liquid is reduced to about 1/3 cup. Whisk in the honey. Whisk in the remaining 1 tablespoon butter until melted. At this point, sauce should be somewhat syrupy (allow to boil a little longer if it is not). Add the grapes and heat through. 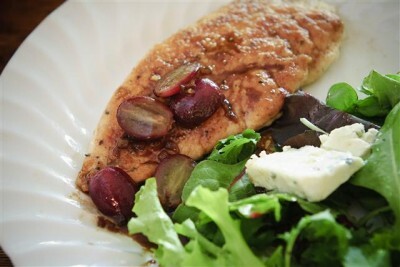 To serve, spoon grapes and sauce over chicken breasts. I discovered this in my copy of your book and it’s now a personal favorite. I love how the well the flavors work! Thanks! That’s so nice to hear, Franz.